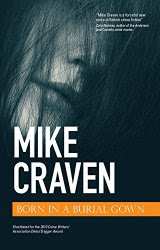 Mike Craven is a native Cumbrian where all his writing is set. His sixteen years in the probation service form a foundation for his work. You can learn more about the author at his website. Detective Inspector Avison Fluke is a man on the edge. He has committed a crime to get back to work, concealed a debilitating illness, and is about to be made homeless. Just as he thinks things can't get any worse, the body of a young woman is found buried on a wet, Cumbrian building site. Shot once in the back of the head, execution style, it is a cold, calculated murder. When the post-mortem reveals she has gone to significant expense in disguising her appearance, and the only clue to her identity is a strange series of numbers, Fluke knows this is no ordinary murder. With the help of a psychotic ex-Para, a gangland leader, and a woman more interested in maggots than people, Fluke must find out who she was and why she was murdered before he can even think about finding her killer. Nothing major for a crime novel.